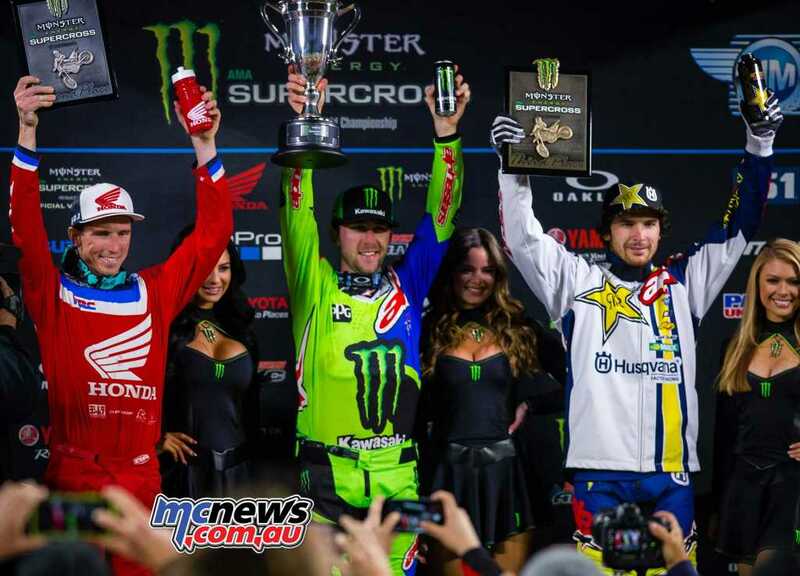 Monster Energy Kawasaki’s Eli Tomac captured the overall event win at Round 3 of the series. 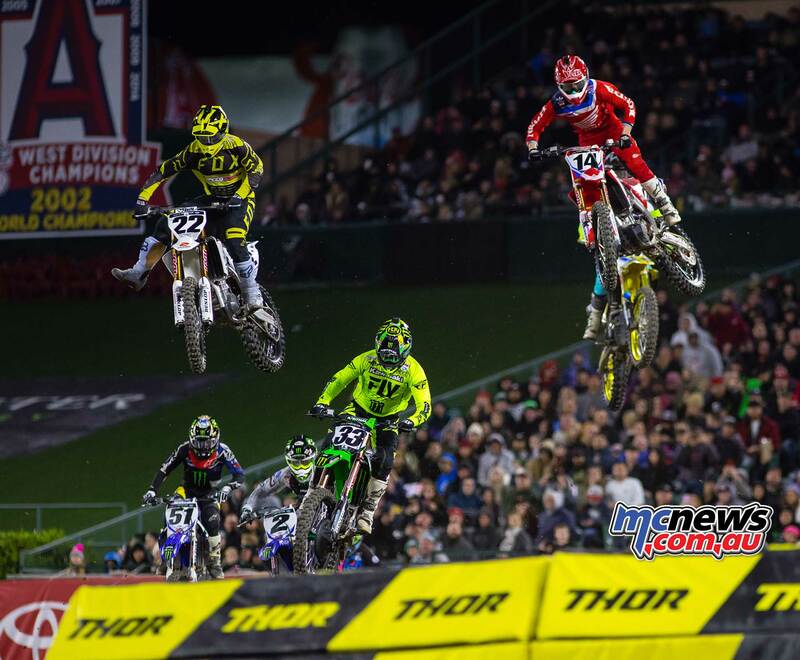 The Triple Crown, which was introduced in 2018, is a three-city showdown starting at Anaheim 2 where both the 250SX and 450SX Classes compete in three Main Events. 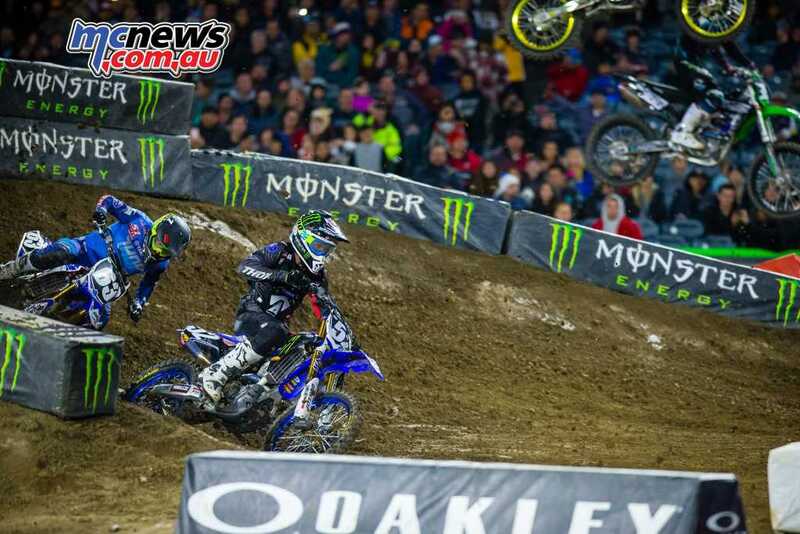 Meanwhile Aussie Chad Reed took 12th, 17th and 16th across the three main events to finish 14th overall for the event. In the first 8-minute 450SX Class Main Event, Team Honda HRC’s Cole Seely captured the lead on the first lap ahead of Justin Brayton while KTM’s Blake Baggett climbed up to third and Tomac was fifth. In the second 12-lap Main Event, Tomac captured his first lead and win ahead of Seely and Rockstar Energy Husqvarna Factory Racing’s Jason Anderson. In the third 15-minute Main Event, Anderson ran away with the win, holding on to his points lead, with Tomac in second and Brayton in third. Tomac, who finished 5-1-2, was awarded the overall win with the lowest combined score. 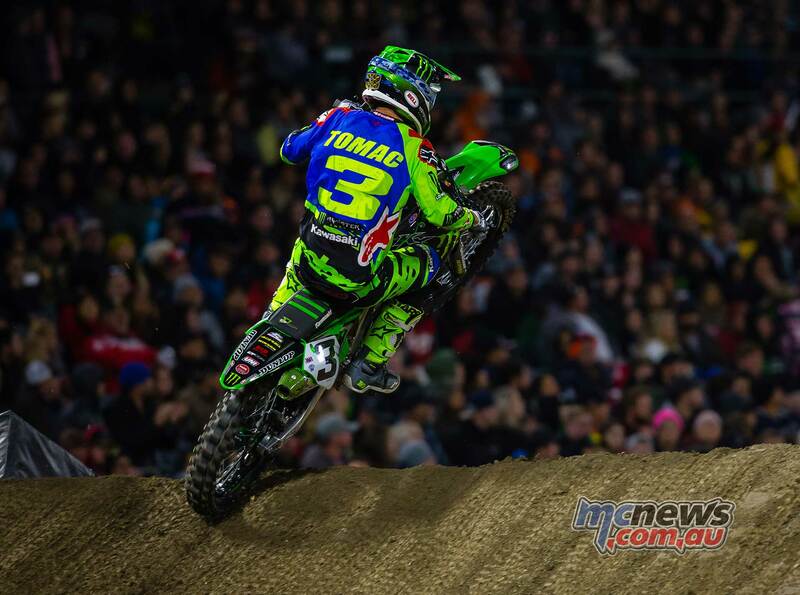 Tomac thus captured the first Monster Energy Supercoss Triple Crown overall victory with a 5-1-2 score. 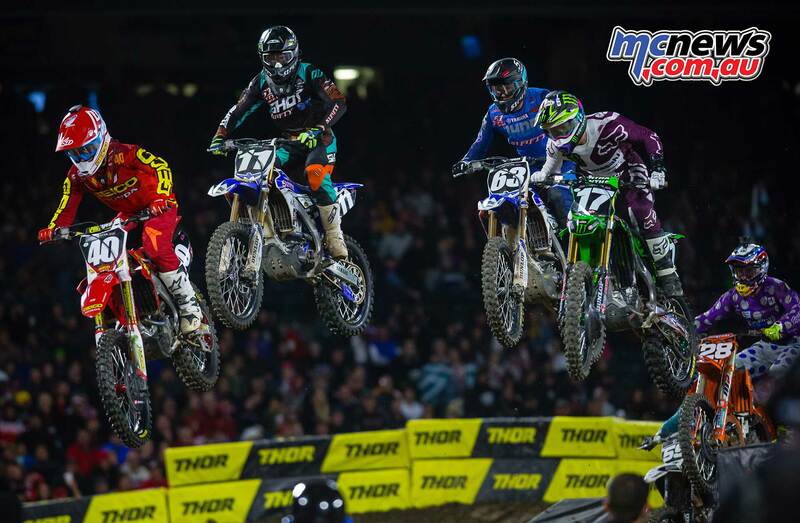 Jason Anderson’s 7-3-1 for third overall extended his lead in the overall 450 championship standings. Anderson now enjoys an 11-point lead over Honda’s Cole Seely while Yamaha’s Justin Barcia is a further two-points down in third. Despite some poor starts and less than expected results at A2 Honda’s Ken Roczen is still firmly in the championship hunt, only a single point away from third placed Barica in the series standings. 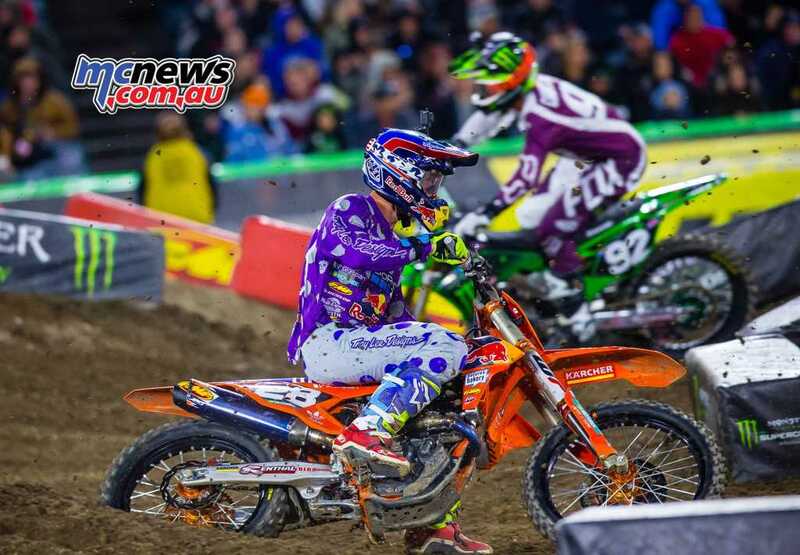 After sustaining a shoulder injury that hindered him from racing just one week ago in Houston, Marvin Musquin came into the weekend with uncertainty about his condition. The Frenchman began the day positively as he qualified 2nd overall in the timed sessions, placing him into the Main Event format with ease. However, in the Main Events, Musquin wasn’t able to get the starts he was looking for, which made it difficult to climb through the pack with the shorter race times. 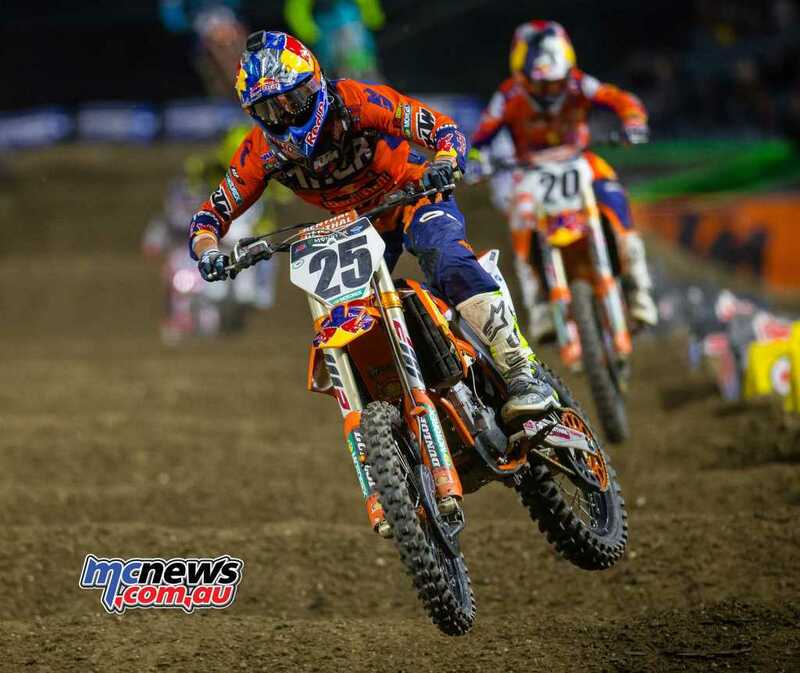 As a result, Musquin was only able to score 9th and 11th place finishes in the first two races of the night. 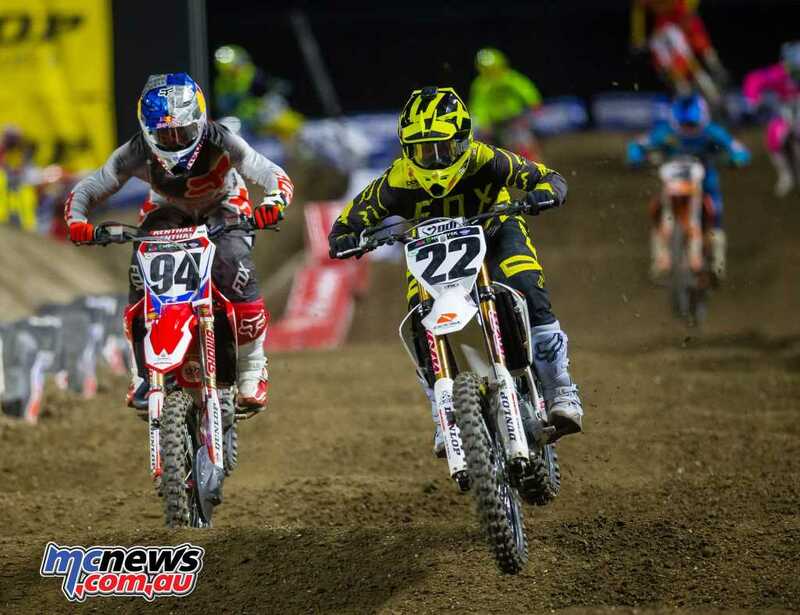 Musquin struggled the most during the third and final race, where he ultimately pulled off after four laps of racing. 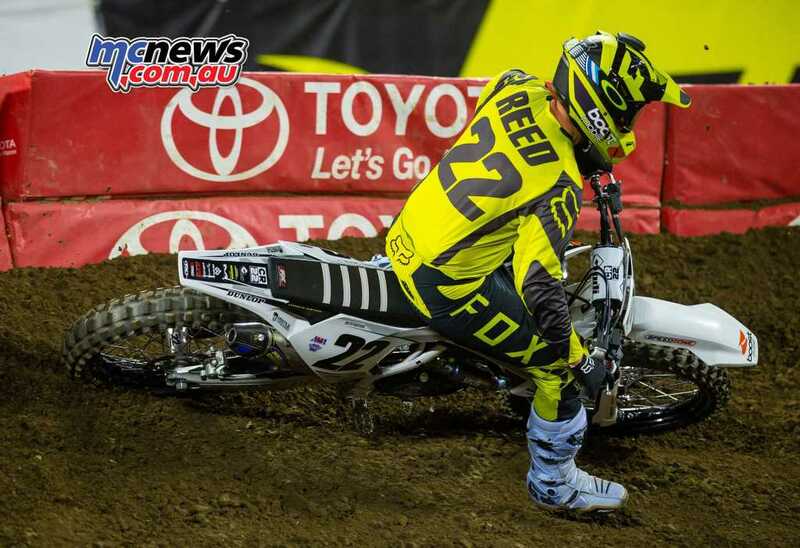 Chad Reed is still struggling from his ankle surgery and carded 12-17-16 results for 14th overall and is now 16th in the championship points chase. 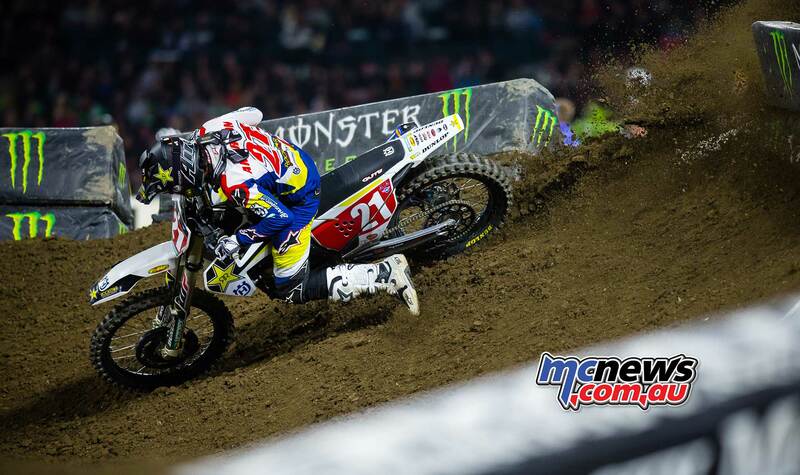 Broc Tickle, too, experienced a tough night in Anaheim as he ultimately finished 16th overall for the evening. 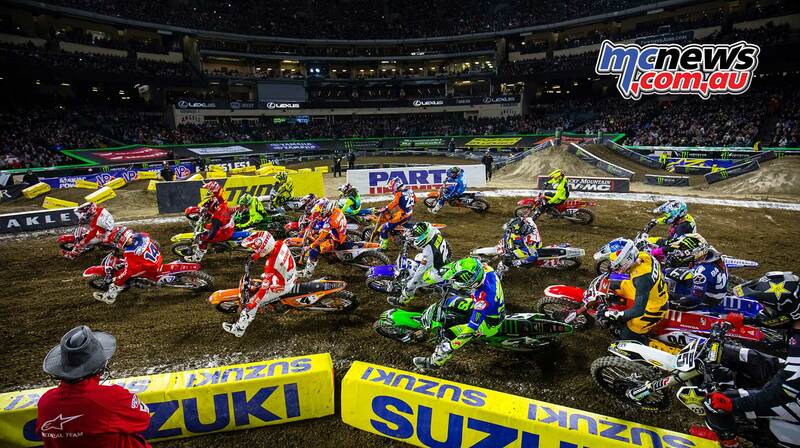 Joey Savatgy took the 250SX win at the Triple Crown at Anaheim 2, on the merit of his two wins and a second place. Aussie Hayden Mellross is getting stronger and placed seventh overall after carding 7-10-8 place finishes from the three races. In the first 6-minute 250SX Class Main Event, Kawasaki’s Joey Savatgy lead from the start ahead of GEICO Honda’s Christian Craig while Yamaha’s Mitchell Oldenburg made his way up to third by the flag. In the second 10-minute Main Event, the KTM of Shane McElrath stayed wide open out front ahead of Savatgy and Craig. 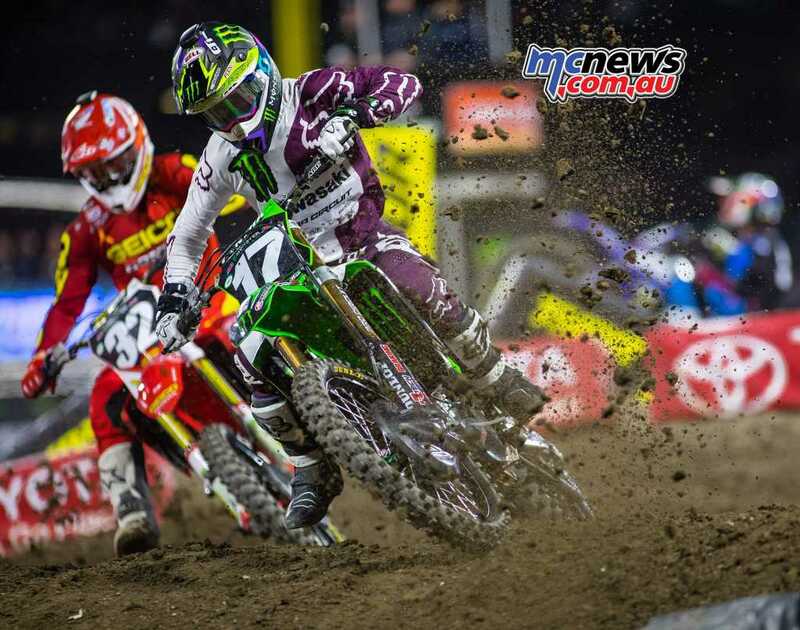 In the third 12-minute Main Event, Savatgy remained up front while Kawasaki’s Adam Cianciarulo held onto second ahead of GEICO Honda’s Chase Sexton in third. Savatgy’s 1-2-1 was good enough for the overall win. Joey Savatgy’s 1-2-1 scores put him earned him the overall victory, five-points ahead of second place. Shane McElrath had a successful experience with the first of three Triple Crown events as he came away with 2nd overall for the night where he sits tied at the top of the 250SX points standings after three rounds. 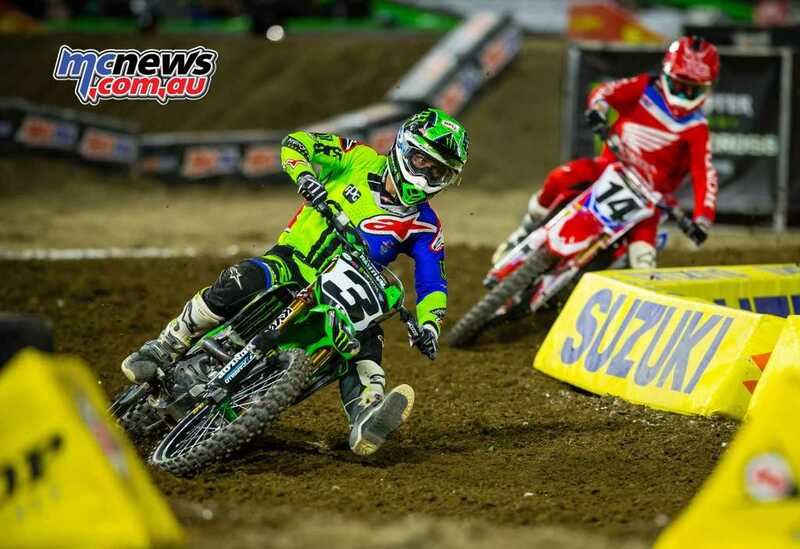 Cianciarulo had a good start to the day, qualifying second. Even with a crash in practice he lined up ready to collect a solid finish. Like his teammate, he got off to some great starts, including in Main Event 1. He ran with the front runners and finished fourth. In Main Event 2, Cianciarulo had to come through the pack and finished the race in fifth. 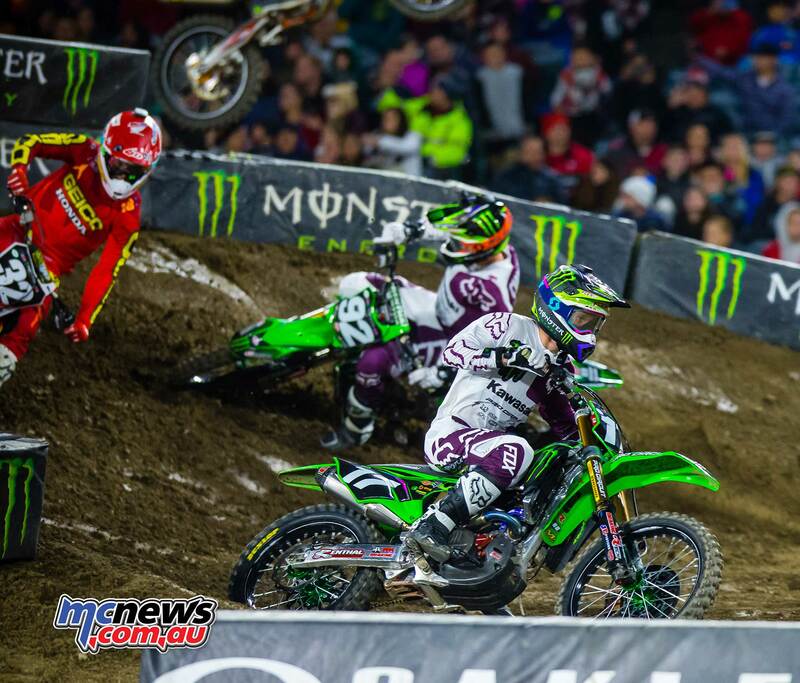 The final and longest main event of the evening was Cianciarulo’s best. Even after starting outside the top five, he charged to the front and finished the 12 minutes plus one lap race only 0.2 seconds behind Savatgy.